Fantasy track created by my crazy mind, and modeled by Chyva Designs from scratch, just based on a simple drawing of the layout and many many many ideas and recomendations. Awesome guy, great car and track modeler!! Thanks dude! 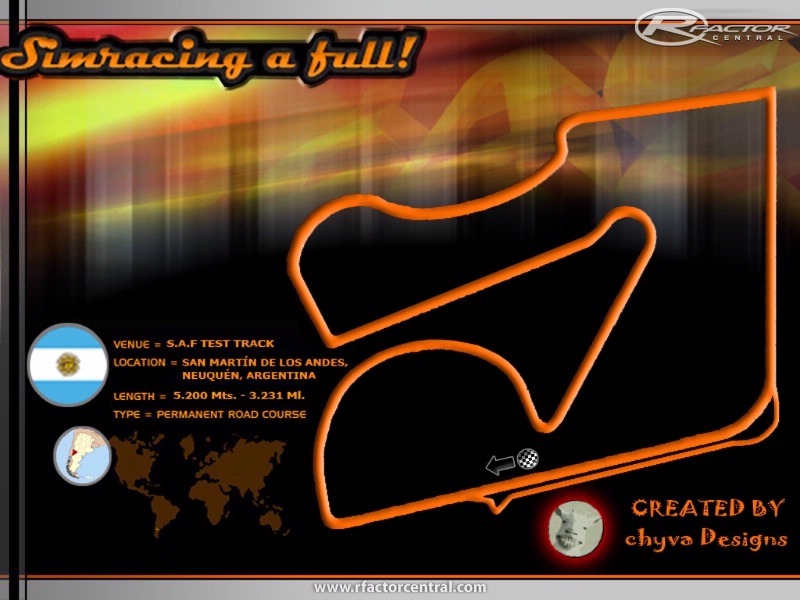 The track has almost everything, long straights, fast and slow turns, wide turns, up's and down's, blind turns and more. You will really enjoy on this track 'cause it was meant to be a fun experience. Circuito de fantasía pensado por mi mente loca y modelado desde 0 por Chyva Designs, basado solamente en un simple dibujo y muchisimas ideas y recomendaciones. Un muchacho espectacular, y un gran modelador de autos y circuitos. Gracias locura! El circuito tiene de todo, largas rectas, curvas rápidas y lentas, curvones amplios, curvas ciegas y más. Realmente disfrutarán girando en este circuito porque fue hecho con ese fin. There are currently no setups for SAF Test Track. Add a Setup. Al fin Chiva pude bajarlo, realmente espectacular el circuito. Te mereces estar aca junto a los grandes. Abrazo che!! Hola flaco, de donde sos?? soy de san martin de los andes y vi que le pusiste san martin a la pista y me parecio buenisimo el proyecto, saludos. We know the tracks still need a lot of work, but keep in mind that this guy did this track, along with 5 MORE!! in the 14 days DEMO version of Bob's Track Builder. That's an awesome work! In the future, if we're able to purchase BTB for him, be sure that his work is gonna be outstanding anda neat. Thanks for all the tips and keep enjoying it. As Rogenater said, it needs some 'trackside items' to give the driver some clues. Also a couple of the camber transitions feel too forced, especially in the banked left to right. Love the drop down to T1!!! Hi: This course is ok but needs brake markers and some cones here and there. Good Work for a start. is the track going in the right direction? the chicane in the pit lane is usually place at the entrance, not the exit. the current entrance is even more problematic since it's right in the braking zone for the last corner. Is this an error in the picture only or does the track actually goes this way?